7 Steps to a Lighter, Brighter You! Recipes from Delia McCabe's new cookbook! Feed Your Brain – The Cookbook is full of more than 100 neuron-nourishing, colourful and delicious recipes that are quick and simple to prepare. 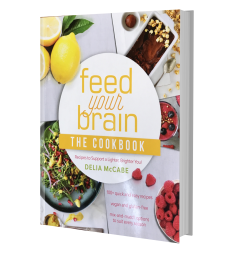 This book takes the science from Delia’s first book and brings it into your kitchen, including tips, tricks and tweaks to make preparing ‘brain food’ simple and pleasurable. Delia has also included fascinating nutritional facts about the best foods available with which to optimally support your hungry brain. Current research reveals that our energy-hungry brain needs large quantities of unprocessed, clean and nutrient-dense foods to help support stable moods, optimum memory, learning and stress management. All the recipes in this book also foster digestive health and decrease cellular inflammation, which directly impact brain health positively. An unexpected side effect is weight loss because food cravings and emotional eating from mood swings disappear when blood glucose stabilises. Following the guidelines and recipes in her latest book Delia has ensured that all the recipes are colourful, not just because of the antioxidants these foods provide, but also because we ‘eat with our eyes.’ Foods flavoured with herbs and spices, along with great ‘mouth feel,’ engage our tastebuds, all of which combine to satisfy our brain and body on every level. 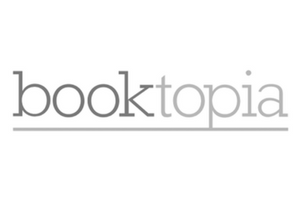 A brief introduction, followed by tips on how to use the Cookbook and FAQ’s about brain foods, sets the scene for the delicious recipes that follow. Delia has added variations to most recipes so that you can adjust ingredients to suit seasonal availability and personal preferences. The recipes are all Gluten Free and ‘child friendly’ too, because Delia started her journey into brain food when her children were very young and made sure they enjoyed the food just as much as their friends did! Feed Your Brain - 7 Steps to a Lighter Brighter You! and ideas behind her original book. Feed Your Brain is the ultimate guide to getting your brain in tip-top shape and keeping it healthy via the foods you eat. It has now been proven beyond a doubt that it is possible to improve focus and memory, reduce stress and anxiety, and think more clearly simply by enjoying a diet rich in the right nutrients. 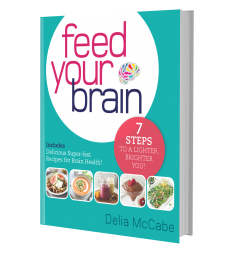 In Part 1 of Feed Your Brain, Delia takes you through her 7-step program, simply and clearly explaining the science behind how the brain works, and showing how vitamins, minerals, fats, oils, carbohydrates and proteins affect brain function. Part 2 of the book features delicious, quick and easy recipes that can form the basis of your new diet while also providing you with inspiration to come up with your own ideas in the kitchen. If you have noticed your memory slipping, have trouble focusing, concentrating or learning, or have mood swings and don’t want to go on medication, have poor sleep, or are feeling stressed and anxious all the time, this is the book for you. Enjoy more happiness, motivation, mental energy and well being by getting your brain to work more efficiently and effectively, simply by learning how to feed your brain.